Easter-Nelson Fence Co. was founded by Walter C. Easter, Sr. (Charlie) and Junior R. Nelson in 1957. Working out of a small garage in Maplewood, MO, they began by installing quality residential wood and chain link fences. Shortly thereafter they innovated the “storefront”, a unique method of burglary protection for businesses in Downtown and North St. Louis. The storefront was a custom made chain link or wrought iron guard designed to prevent would-be burglars from entering through broken windows or doors. By 1974 Easter-Nelson Fence Co. had grown to be one of the largest and most respected providers of both residential and commercial fences to the St. Louis and surrounding areas. 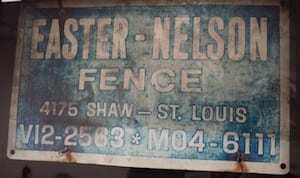 It was in 1974 that Easter-Nelson Fence Co. incorporated and moved to their current four (4) acre facility in South St. Louis County. In 1983, upon the retirement of Mr. Nelson, the name was changed to Easter Fence, Inc. In 2013, upon the passing of Charlie, his son Walter C. Easter, Jr. (Chuck) took over at the helm. 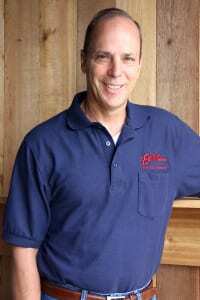 Under Chuck’s leadership Easter has expanded into a full-service fence, deck and renovation business and operates under the dba of Easter Fence, Deck & Renovations. Leading the new division and team of skilled carpenters is Russell Flood. Russ came to Easter with over twenty (20) years of experience building custom homes in the St. Louis area. His standard of excellence, meticulous attention to detail and uncompromising integrity fit perfectly with the Easter model. Thank you for visiting the Easter website. The Easter family and staff considers it an honor to serve you. You’re not just a customer, but a friend and neighbor.